I just love this bag. It will be a classic for my collection for sure. Everyone loves the style and the versatility of this handbag. 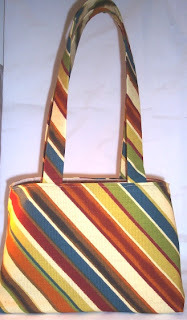 This handbag can be used during the day for everyday functions and can be used at night. I have yet to create an "evening" Mimi handbag but it IS in the makings. Please stop by my store to check out all the different colors and sizes of this wonderful little or big bag. I am sure you will love it, like everyone else! I knew my patience was growing shorter as I am growing older, that’s why I decided NOT to go back to school for my teaching degree. I enjoy working with children, but my patience will not allow me to help a child that may struggle at what I am teaching. I have found that I do enjoy working with kids on fun things, like playing games and being creative. When my daughter asked me a month or so ago to sew, I was ecstatic. My daughter and I would finally join and do something we both enjoy. I didn’t think it would to bad teaching her some basic skills (winding bobbins, threading the machine, backstitching, etc.). I sat her down at the machine and showed her all the different parts. I told her what each part did. I also had her practice stepping on the treadle to learn control. She liked to make it go really fast. I remember sewing when I was younger and thinking that going faster would be better, only to find out that sewing at a slower pace help avoid taking time to correct mistakes. She did not enjoy pinning and pressing the he of the pillowcase. I explained that sewing is more than just sitting at the machine and sewing. There is a lot more to it. You may not like pinning, or cutting or pressing, but if you do not do these things, your garment may not turn out as great as it could be. After measuring and pinning, she finally got to sew. She sat quietly and did a very good job on trying to keep her stitching straight. There were mistakes but I didn’t want to discourage her by pointing them out. It took us about 3 hours start to finish creating her pillowcase. She is very proud of what she has done and want’s to move onto creating clothes for her American Girl doll she received for Christmas. Finally I am here on Blogspot. I have been looking around here for awhile and decided to post away. I have a few MySpace accounts, but at times I feel no one really reads your blogs on there anyway. So here's my attempt in blogging and posting all the things that are in my mind. All the ideas and creative visions I have for my bags. I hope you enjoy and come back and comment often.